Each computer must have a power supply in it. 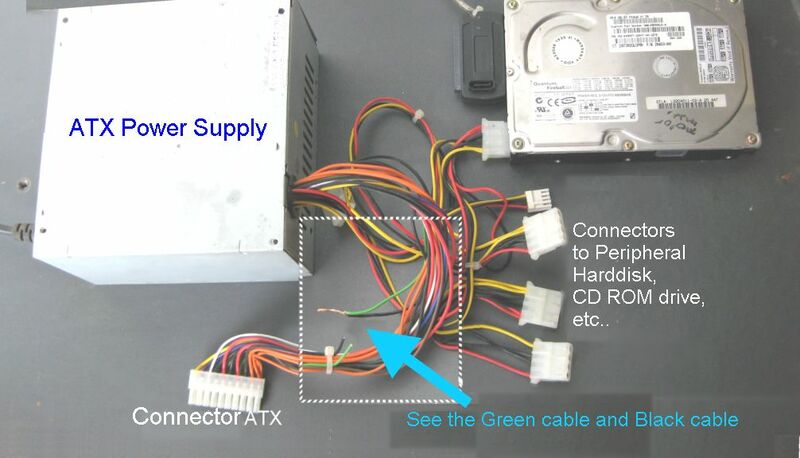 Desktop computers nowadays normally use power supply ATX (Advanced Technology Extended). For those of you who understand the electronic power supply can also be used for electronic equipment or to experiment, because the power supply uses a switching system has a higher power capacity, more efficiently than with a power supply that uses transformator. Output DC (direct current) from the power supply is 0V (common) +3.3 V +5 V +12 V-5V and-12V. When input has been given the voltage AC (110/220V), power supply is still dead / not be immediately life (work), To turn it on, GREEN colored wires should be connected to one of the cables is colored BLACK. • Prepare equipment: scissors / cutters, insulation. • Combine both end of the cables, by twisted (rotated), make sure connected properly.